provide sufficient due process and that confinement in Pelican Bay’s SHU for ten or more years violated the United States Constitution. 1. CDCR shall no longer place prisoners into any SHU, Administrative Segregation, or the Step Down Program solely because of gang validation status. Instead, all SHU or Step Down Program placements of validated CDCR prisoners shall be based solely on a conviction of a SHU-eligible offense following a disciplinary due process hearing. 2. CDCR will no longer impose indeterminate SHU sentences, with a limited exception called Administrative SHU, imposed after a prisoner has served a determjnate SHU term when the Departmental Review Board decides that overwhelming evidence shows that a prisoner presents an immediate threat and cannot be assigned to less restrictive housing. CDCR will provide enhanced out-of-cell recreation and programming for these prisoners of 20 hours per week, and its placement decision is subject to review by Magistrate Judge Nandor J. Vadas. CDCR expects that a small number of prisoners will be retained in Administrative SHU. 3. CDCR will not house any inmate involuntarily in Pelican Bay’s SHU for more than five continuous years. a SHU-eligible rule violation with a proven Security Threat Group (STG) nexus within the last 24 months, he shall be released from the SHU and transferred to a General Population facility consistent with his case factors. Those who have been incarcerated in a for more than ten years will generally be released from the SHU, even if they have committed a recent SHU-eligible offense and allowed to serve the remainder of the SHU term and their Step Down Program time in the new Restrictive Custody General Population unit. 5. The Step Down Program will be shortened from four to two years, and prisoners will be transferred from SHU after two years in the Step Down Program unless they commit a new SHU-eligible offense. visits, small group programming, and yard/out-of-cell time commensurate with Level IV general population in small group yards. Prisoners subject to transfer to the RCGP are those who: (i) refuse to complete required Step Down Program components; (ii) are found guilty of repeated STG violations while in the Step Down Program; (iii) face a substantial threat to their personal safety if released to the general population; or (iv) have been housed in a SHU for 10 or more continuous years and have committed a SHU eligible offense with a proven STG nexus within the preceding 24 months. 7. CDCR will train staff about the Agreement’s requirements, including training to ensure that confidential information used against prisoners is accurate. 8. Plaintiffs’ representatives and their counsel, with the assistance of Magistrate Judge Vadas, will have an active, ongoing role in overseeing implementation and enforcement of the Settlement Agreement, including the opportunity to raise before Magistrate Judge Vadas alleged violations of the Agreement or the Constitution. 9. The Court will retain jurisdiction over this case for two years. Plaintiffs may extend the Court’s jurisdiction by showing that current and ongoing systemic violations of the Eighth Amendment or the Due Process Clause of the Fourteenth Amendment exist; otherwise, the Court’s jurisdiction and the parties’ Agreement automatically ends. 10. Plaintiffs will file a motion for attorneys’ fees following entry of a final order approving the Agreement. Adriano Hrvatin, 455 Golden Gate Ave., Suite 11000, San Francisco, CA 94102. 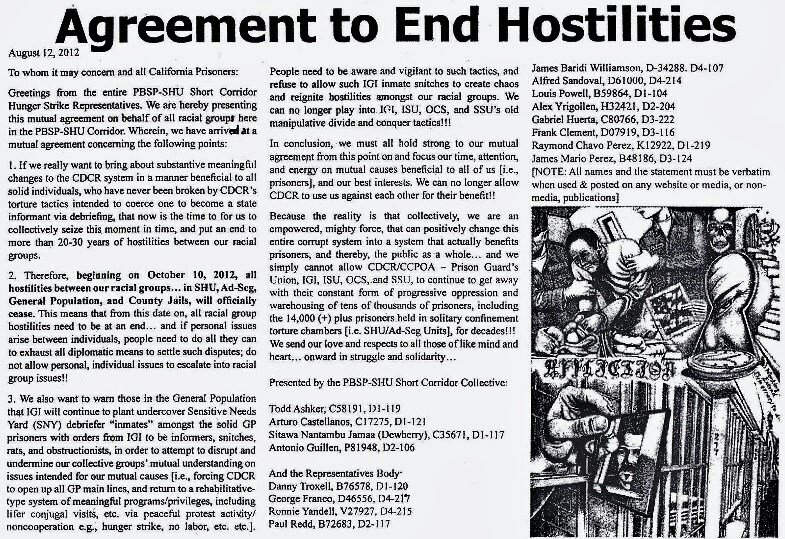 The parties enter into this Settlement Agreement (the Agreement) to address and settle Plaintiffs’ claims for declaratory and injunctive relief regarding the policies and practices of the California Department of Corrections and Rehabilitation (CDCR) for placing, housing, managing, and retaining inmates validated as prison gang members and associates, as well as the conditions of confinement in the Security Housing Unit (SHU) at Pelican Bay State Prison and other CDCR SHU facilities. 1. Plaintiffs in this matter are inmates Todd Ashker, Ronnie Dewberry, Luis Esquivel, George Franco, Jeffrey Franklin, Richard Johnson, Paul Redd, Gabriel Reyes, George Ruiz, and Danny Troxell (Plaintiffs). 2. Defendants are the Governor of the State of California, CDCR’s Secretary, Pelican Bay’s Warden, and the Chief of CDCR’s Office of Correctional Safety, each of whom is sued in his official capacity (Defendants). 3. This action was originally filed on December 9, 2009, as an individual pro se civil rights suit by Plaintiffs Todd Ashker and Danny Troxell. A First Amended Complaint was filed on May 21, 2010. On September 10, 2012, Plaintiffs, having retained counsel, filed a Second Amended Complaint, which added class allegations and eight additional Plaintiffs. The Second Amended Complaint alleges that CDCR’s gang management regulations and practices violate the Due Process Clause of the Fourteenth Amendment and that the conditions of confinement in Pelican Bay’s SHU constitute cruel and unusual punishment in violation of the Eighth Amendment. The Second Amended Complaint seeks declaratory and injunctive relief to address the alleged constitutional violations. 6. On October 18, 2012, CDCR implemented its Security Threat Group (STG) program as a pilot program which modified the criteria for placement into the SHU and initiated a Step Down Program designed to afford validated inmates a way to transfer from the SHU to a general population setting within three or four years. On October 17, 2014, and upon expiration of the pilot, CDCR’s STG regulations were approved and adopted in Title 15. 8. Apart from a 45-day litigation stay in early 2014 to discuss settlement, the parties engaged in extensive discovery for over three years. Fact discovery closed on November 28, 2014. The parties responded to hundreds of written discovery requests, produced hundreds of thousands of pages of documents, and completed approximately thirty depositions of current and former prison officials and inmates. Expert discovery closed on May 29, 2015. Plaintiffs disclosed ten experts, Defendants disclosed seven, and the parties collectively completed a dozen expert depositions. The parties produced over 45,000 pages of documents in response to subpoenas directed to their respective experts. 9. The parties have conducted extensive negotiations over several months to resolve Plaintiffs’ demands that CDCR revise its gang management and SHU policies and practices. Those negotiations have been undertaken at arm’s length and in good faith between Plaintiffs’ counsel and high-ranking state officials and their counsel. The parties have reached agreement on statewide policies and practices to settle Plaintiffs’ claims for declaratory and injunctive relief, and, for settlement purposes only, agree that this Agreement meets the requirements of 18 U.S.C. § 3626(a)(1). 10. The parties agree that the putative supplemental class asserted in Plaintiffs’ Supplemental Complaint—namely, all prisoners who have now, or will have in the future, been imprisoned in Pelican Bay’s SHU for longer than 10 continuous years and then transferred from Pelican Bay’s SHU to another SHU in California in connection with CDCR’s Step Down Program—may be certified as a class for settlement purposes under Rule 23(b)(2) of the Federal Rules of Civil Procedure. The parties agree that, after notice and an opportunity to object is provided to members of the two classes previously certified by the Court as well as members of the supplemental settlement class, the Court may enter an order finding this Agreement to be fair and reasonable to all class members. 11. All parties and their counsel recognize that, in the absence of an approved settlement, they face lengthy and substantial litigation, including trial and potential appellate proceedings, all of which will consume time and resources and present the parties with ongoing litigation risks and uncertainties. The parties wish to avoid these risks, uncertainties, and consumption of time and resources through a settlement under the terms and conditions of this Agreement. ACCORDINGLY, without any admission or concession by Defendants of any current and ongoing violations of a federal right, all claims for declaratory and injunctive relief asserted in the Second Amended Complaint and Supplemental Complaint shall be finally and fully settled and released, subject to the terms and conditions of this Agreement, which the parties enter into freely, voluntarily, knowingly, and with the advice of counsel. 12. The Court has jurisdiction of this matter under 28 U.S.C. §§ 1331 and 1343. Venue is proper under 28 U.S.C. § 1391(b) because a substantial part of the events giving rise to Plaintiffs’ claims occurred in the Northern District of California. A. NEW CRITERIA FOR PLACEMENT IN SHU, ADMINISTRATIVE SEGREGATION, OR THE STEP DOWN PROGRAM. 13. CDCR shall not place inmates into a SHU, Administrative Segregation, or Step Down Program solely on the basis of their validation status. 14. CDCR shall amend the SHU Assessment Chart located in Title 15 of the California Code of Regulations, section 3341.5, subsection (c)(9). The SHU Assessment Chart shall be amended as set forth in Attachment B. 15. Under the revised Step Down Program policy, STG-I inmates, as defined in Title 15 of the California Code of Regulations, section 3000, will be transferred into the Step Down Program if they have been found guilty in a disciplinary hearing of committing, with a proven nexus to an STG, a SHU-eligible offense, as listed in the SHU Assessment Chart. 16. STG-II inmates, as defined in Title 15 of the California Code of Regulations, section 3000, will be transferred into the Step Down Program if they have been found guilty in a disciplinary hearing of committing, with a proven nexus to a STG, two SHU-eligible offenses within a four year period, as listed in the SHU Assessment Chart. 17. Any STG-I or STG-II inmate shall be transferred into the Step Down Program as described in Paragraphs 15 and 16, upon the completion of the determinate, disciplinary SHU term imposed by the Institution Classification Committee for that offense. All time spent in the SHU following completion of the determinate SHU term prior to actual transfer into the Step Down Program shall be credited as part of the inmate’s Step Down Program time. The Institution Classification Committee shall continue to have the authority to impose, commute, or suspend any part of the determinate SHU term, as provided in regulations. B. MODIFICATIONS TO THE STEP DOWN PROGRAM. 18. CDCR shall modify its Step Down Program so that it is based on the individual accountability of each inmate for proven STG behavior, and not solely on the inmate’s validation status or level of STG affiliation. 19. The revised Step Down Program shall be 24 months in duration and consist of 4 program steps that take place within a SHU. Except as provided in Paragraphs 22 and 23, each step will be 6 months in duration. Step 5 of the existing Step Down Program shall be eliminated. Upon successful completion of the Step Down Program, the inmate shall be transferred to a General Population prison commensurate with his specific case factors and in accordance with existing regulations. 20. Each Step within the Step Down Program shall provide incremental increases in privileges and freedom of movement commensurate with program placement as set forth in Attachment A. 21. The Step Down Program incorporates rehabilitative programming consisting of both required and elective components. Within 90 days of the Court’s preliminary approval of this Agreement, CDCR will afford Plaintiffs’ counsel and four inmate representatives identified by Plaintiffs an opportunity to meet with CDCR officials to discuss the nature, content and substance of the mandatory and elective programming. It is CDCR’s intent to provide programming with clear requirements and outcomes to provide an alternative path away from STG behavior and promote critical life skills. CDCR shall convene a panel of experts, of CDCR’s choosing, to evaluate the Step Down Program curriculum and to make recommendations in keeping with this intent. CDCR will provide Plaintiffs’ counsel with a copy of the panel of experts’ recommendations. Plaintiffs’ counsel and the four inmate representatives will have the opportunity to meet with Defendants regarding recommended components; however, CDCR retains its discretion to implement the mandatory programming of its choosing for this population. 22. 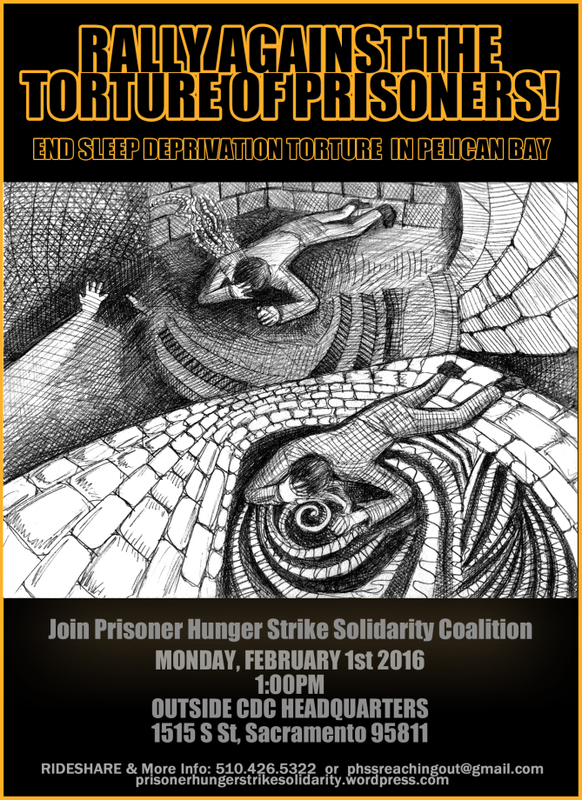 Participation in the Step Down Program is mandatory for any inmate placed into the program. An inmate’s refusal to participate in or complete the required programming in the Step Down Program shall not result in regression or retention in the program, but shall be addressed as follows: At the 180-day review performed by the Institution Classification Committee at the end of Step 3, if the Committee determines that the inmate refused to participate in or has not completed all components of the Step Down Program, the Committee shall retain the nonparticipating inmate in Step 3 for an additional 6 months. If, at the end of that additional 6-month period, the inmate continues to refuse or does not complete all Step Down Program components, the Institution Classification Committee shall remove the inmate from the program and transfer him to a Restricted Custody General Population (RCGP) facility. That inmate shall be assigned to the Step 3 privilege group, however the Institution Classification Committee may later reassign the inmate to the Step 4 privilege group based on his progression through the commensurate Step Down Program components remaining to be completed. If the inmate elects to complete the Step Down Program requirements, he shall do so within the RCGP and shall not be returned to the SHU to complete the program, unless he is found guilty in a disciplinary hearing of a new SHU eligible offense. If the inmate completes the Step Down Program components and, while in the RCGP, is not found guilty of either one serious STG-related or two administrative STG-related rules violations as listed in the STG Disciplinary Matrix, during the 180-day review period, he will then be released to the General Population. (See Attachment C.) The Institution Classification Committee shall conduct reviews no less than every 180-days to determine whether the inmate has completed the Step Down Program and is eligible for release to the General Population. Non-participation or lack of completion that is due to the unavailability or inaccessibility of programming components necessary for Step Down Program compliance shall not impede an inmate’s progress to the next step and shall not be considered as a factor in an inmate’s regression or retention in any step. CDCR shall provide an opportunity for each inmate to complete Step Down Program programming for each step within 6 months. All time spent awaiting transfer to another step shall be credited to the completion of the next step. 23. The Step Down Program is intended to be a rehabilitative, gang behavior diversion program for STG affiliated inmates. As such, inmates within the program are expected to remain disciplinary-free. Misconduct shall be addressed in accordance with existing disciplinary rules and regulations. The commission of repeated STG violations while in the Step Down Program shall not result in regression or retention in the program, but shall be addressed as follows: If an inmate has committed either 3 serious STG rules violations or 5 administrative STG rules violations as listed in the STG Disciplinary Matrix while in the Step Down Program, he shall be transferred to the RCGP facility. The Institution Classification Committee shall review the inmate’s disciplinary history and make this determination during the 180-day reviews performed at the end of Steps 3 and 4. If, during the Step 3 review, the inmate is guilty of committing 3 serious STG rules violations or 5 administrative STG rules violations while in the Step Down Program, the Committee shall retain the inmate in Step 3 for an additional 6 months. At the end of that additional 6-month period, the Committee shall remove the inmate from the program and transfer him to the RCGP. An inmate transferred to the RCGP pursuant to this Paragraph shall be assigned to the Step 3 privilege group. The inmate can appeal the decision to transfer him to the RCGP to the Departmental Review Board, which would review the inmate’s disciplinary history and determine whether removal from the program and transfer to the RCGP is appropriate; a hearing before the Board is not required for a determination of such an appeal. Consistent with Paragraph 22, if the inmate completes the Step Down Program components and, while housed in the RCGP, is not found guilty of either one serious STG-related or two administrative STG-related rules violations as listed in the STG Disciplinary Matrix during the RCGP 180-day review period, he will then be released to the General Population. The Institution Classification Committee shall conduct reviews no less than every 180-days to determine whether the inmate has completed the Step Down Program and is eligible for release to the General Population. 24. If an inmate is found guilty of committing a SHU-eligible offense while assigned to the Step Down Program or RCGP, he shall complete the intervening determinate, disciplinary SHU term as imposed by the Institution Classification Committee for that offense before returning to the Step Down Program or RCGP. If such SHU-eligible offense has a proven nexus to an STG as described in Paragraphs 15 and 16, upon completion of the determinate term imposed by the Committee, the inmate shall be returned to the Step Down Program at Step 1 or another step as determined by the Committee. C. REVIEW OF STG-VALIDATED INMATES CURRENTLY IN SHU. 25. Within twelve months of the Court’s preliminary approval of this Agreement, CDCR shall review the cases of all validated inmates who are currently in the SHU as a result of either an indeterminate term that was previously assessed under prior regulations or who are currently assigned to Steps 1 through 4, or who were assigned to Step 5 but are retained within the SHU. These reviews shall be conducted by Institution Classification Committees and prioritized by the inmates’ length of continuous housing within a SHU so that those of the longest duration are reviewed first. If an inmate has not been found guilty of a SHU-eligible rule violation with a proven STG nexus within the last 24 months, he shall be released from the SHU and transferred to a General Population level IV 180-design facility, or other general population institution consistent with his case factors. An inmate who has committed a SHU-eligible rule violation with an STG nexus within the last 24 months shall be placed into the Step Down Program based on the date of the most recent STG-related rule violation, as follows: Step 1: violation occurred within the last 6 months; Step 2: violation occurred within the last 6-12 months; Step 3: violation occurred within the last 12-18 months; Step 4: violation occurred within the last 18-24 months. Inmates currently assigned to Step 5 in the General Population shall remain in the General Population and shall no longer be considered current Step Down Program participants. 26. During the review described in Paragraph 25, any inmate housed in a SHU program for 10 or more continuous years who has committed a SHU-eligible offense with a nexus to an STG within the preceding 2 years, will be transferred into the RCGP for completion of Step Down Program requirements. Inmates subject to this provision who are currently serving a disciplinary SHU term will be allowed to complete the SHU term in the RCGP prior to beginning the Step Down Program, unless the Institution Classification Committee determines by a preponderance of the evidence that to do so would pose an unreasonable risk to individual or institutional safety and security. This function of the RCGP shall be implemented as a pilot program. If the inmate completes the Step Down program requirements, he will be transferred to a General Population prison setting in accordance with his case factors. One hundred twenty days after completion of the reviews described in Paragraph 25, CDCR will produce a report on the functioning of this pilot program and shall inform plaintiffs’ counsel whether it intends to make permanent, modify, or terminate this RCGP function. Within 30 days of receiving the notice from CDCR, the parties shall meet and confer regarding any proposed changes to the RCGP pilot program. If CDCR decides to terminate the RCGP pilot program, inmates housed in the RCGP pursuant to this Paragraph will, in the absence of pending disciplinary charges of a new SHU-eligible offense requiring segregation, either remain in the RCGP until they transition into General Population or will be transferred to non-segregated housing. 27. For those STG inmates considered for release to the General Population either following Step Down Program completion or pursuant to the review described in Paragraph 25, and against whom there is a substantial threat to their personal safety should they be released to the General Population as determined by a preponderance of the evidence, the Departmental Review Board retains the discretion, in accordance with existing authority, to house that inmate in alternate appropriate non SHU, non-Administrative segregation housing commensurate with his case factors, such as a Sensitive Needs Yard or RCGP, until such time that the inmate can safely be housed in a general population environment. The Departmental Review Board shall articulate the substantial justification for the need for alternative placement. If the Institution Classification Committee refers a case to the Departmental Review Board pursuant to this Paragraph, the Departmental Review Board shall prioritize these case reviews and expeditiously conduct the hearing and render its placement decision. Thereafter, during their regular 180-day reviews, the Institution Classification Committee shall verify whether there continues to be a demonstrated threat to the inmate’s personal safety; and if such threat no longer exists the case shall be referred to the Departmental Review Board for review of housing placement as soon as practicable. For Departmental Review Board hearings held pursuant to this Paragraph, a staff assistant shall be provided to help inmates prepare and present their case due to the fact that the complexity of these types of cases makes assistance necessary. If Plaintiffs’ counsel contends that CDCR has abused its discretion in making housing decisions under this Paragraph, that concern may be raised with Magistrate Judge Nandor J. Vadas in accordance with the dispute resolution and enforcement procedures set forth in Paragraphs 52 and 53 below to determine whether CDCR has articulated substantial justification by a preponderance of the evidence for alternative placement. D. THE RESTRICTIVE CUSTODY GENERAL POPULATION HOUSING UNIT. 28. The RCGP is a Level IV 180-design facility commensurate with similarly designed high security general population facilities. Inmates shall be transferred to the RCGP if they have refused to complete Step Down Program components as described in Paragraph 22; if they have been found guilty of repeated STG violations while in the Step Down Program as described in Paragraph 23; if identified safety concerns prevent their release to General Population and the RCGP is deemed to be appropriate as described in Paragraph 27; or if they meet the eligibility for placement in the RCGP under the pilot program described in Paragraph 26. Programming for those inmates transferred to or retained in the RCGP will be designed to provide increased opportunities for positive social interaction with other prisoners and staff, including but not limited to: Alternative Education Program and/or small group education opportunities; yard/out of cell time commensurate with Level IV GP in small group yards, in groups as determined by the Institution Classification Committee; access to religious services; support services job assignments for eligible inmates as they become available; and leisure time activity groups. Contact visiting shall be limited to immediate family and visitors who have been pre-approved in accordance with existing Title 15 visiting regulations, and shall occur on the schedule set forth in Attachment A. Other privileges provided in the RCGP are also set forth in Attachment A. CDCR policy is that inmate movement, programming, and contact visits within the RCGP shall not require the application of mechanical restraints; any application of restraints shall be in accordance with existing Title 15, section 3268.2. CDCR will provide Plaintiffs’ counsel with the opportunity to tour the proposed RCGP facility and to meet and confer with Defendants regarding the functioning and conditions of the RCGP, prior to its implementation. 29. An inmate may be retained in the SHU and placed on Administrative SHU status after serving a determinate SHU sentence if it has been determined by the Departmental Review Board that the inmate’s case factors are such that overwhelming evidence exists supporting an immediate threat to the security of the institution or the safety of others, and substantial justification has been articulated of the need for SHU placement. Inmates may also be placed on Administrative SHU status if they have a substantial disciplinary history consisting of no less than three SHU terms within the past five years and the Departmental Review Board articulates a substantial justification for the need for continued SHU placement due to the inmate’s ongoing threat to safety and security of the institution and/or others, and that the inmate cannot be housed in a less restrictive environment. Inmates currently serving an Administrative SHU term may continue to be retained in the SHU based on the criteria set forth in this Paragraph. The Institution Classification Committee shall conduct classification reviews every 180 days in accordance with Title 15, section 3341.5. The Departmental Review Board shall annually assess the inmate’s case factors and disciplinary behavior and shall articulate the basis for the need to continue to retain the inmate on Administrative SHU status. The inmate’s privilege group shall be set in a range similar to S-1 to S-5, which can be modified by the Institution Classification Committee during the inmate’s classification review, if deemed appropriate. CDCR shall provide inmates placed on Administrative SHU status with enhanced out of cell recreation and programming of a combined total of 20 hours per week. It is CDCR’s expectation that a small number of inmates will be retained in the SHU pursuant to this Paragraph. If Plaintiffs’ counsel contends that CDCR has abused its discretion in making a housing decision under this Paragraph, that concern may be raised with Magistrate Judge Vadas in accordance with the dispute resolution and enforcement procedures set forth in Paragraphs 52 and 53 below to determine whether the Defendants’ decision meets the evidentiary standards and criteria set forth in this Paragraph. 30. The initial decision to place an inmate on Administrative SHU status, as described in Paragraph 29, can only be made by the Departmental Review Board. 31. At each 180-day review, institutional staff shall identify all efforts made to work with each inmate on Administrative SHU status to move the inmate to a less restrictive environment as soon as case factors would allow. F. HOUSING ASSIGNMENT TO PELICAN BAY’S SHU. 32. Notwithstanding Paragraph 29 above, CDCR shall not house any inmate within the SHU at Pelican Bay State Prison for more than 5 continuous years. Inmates housed in the Pelican Bay SHU requiring continued SHU placement beyond this limitation will be transferred from the Pelican Bay SHU to another SHU facility within CDCR, or to a 180-design facility at Pelican Bay. Inmates who have previously been housed in the Pelican Bay SHU for 5 continuous years can only be returned to the Pelican Bay SHU if that return has been specifically approved by the Departmental Review Board and at least 5 years have passed since the inmate was last transferred out of the Pelican Bay SHU. 33. Notwithstanding Paragraph 32 above, inmates may request in writing that they be housed in the Pelican Bay SHU in lieu of another SHU location, but such a request must be reviewed and approved by the Departmental Review Board. An inmate’s request to remain housed in the Pelican Bay SHU shall be reviewed and documented by the Institution Classification Committee at each scheduled Committee hearing. 34. CDCR shall adhere to the standards for the consideration of and reliance on confidential information set forth in Title 15 of the California Code of Regulations, section 3321. To ensure that the confidential information used against inmates is accurate, CDCR shall develop and implement appropriate training for impacted staff members who make administrative determinations based on confidential information as part of their assigned duties, consistent with the general training provisions set forth in Paragraph 35. The training shall include procedures and requirements regarding the disclosure of information to inmates. 35. CDCR shall adequately train all staff responsible for implementing and managing the policies and procedures set forth in this Agreement. Plaintiffs’ counsel shall be provided an advanced copy of all such training materials with sufficient time to meet and confer with Defendants, prior to the implementation of the trainings. Plaintiffs are entitled to have an attorney attend training sessions on these modifications, no greater than 6 times per year. 36. CDCR shall promulgate regulations, policies and procedures governing the STG management and Step Down Program as set forth in this agreement. The pilot program described in Paragraph 26 will not be required to be promulgated in regulations, unless the pilot program is made permanent. n. A random, representative sample of Rules Violation Reports relied upon to deny an inmate progression through the Step Down Program, including redacted confidential sections, on a quarterly basis. 38. Any and all confidential information provided shall be produced in redacted form where necessary, be designated as “Attorneys’ Eyes Only” as defined in the protective order in this case, and shall be subject to the protective order. CDCR shall provide Magistrate Judge Vadas, upon request, unredacted copies for in camera review in order to resolve any disputes in accordance with Paragraphs 52 and 53, below. 39. Representative samples, as discussed in this Paragraph, shall be of sufficient size to allow a determination regarding CDCR’s pattern and practice, but shall be reasonable in amount such that compliance with the request is not overly burdensome. Any disputes regarding data and document production shall be submitted to Magistrate Judge Vadas in accordance with the dispute resolution and enforcement procedures set forth in Paragraphs 52 and 53 below. 40. Plaintiffs’ counsel shall be entitled to meet and speak with all inmates covered by this agreement. Institutional staff shall facilitate Plaintiffs’ counsel’s requests for reasonable access to these individuals without undue delay, whether by telephone, mail, or personal visit. Defendants shall facilitate Plaintiffs’ counsel having telephone conference calls with Plaintiff class representatives as a group annually. 41. Plaintiffs shall have thirty days after the end of the twenty-four-month period to seek an extension, not to exceed twelve months, of this Agreement and the Court’s jurisdiction over this matter by presenting evidence that demonstrates by a preponderance of the evidence that current and ongoing systemic violations of the Eighth Amendment or the Due Process Clause of the Fourteenth Amendment of the United States Constitution exist as alleged in Plaintiffs’ Second Amended Complaint or Supplemental Complaint or as a result of CDCR’s reforms to its Step Down Program or the SHU policies contemplated by this Agreement. Defendants shall have an opportunity to respond to any such evidence presented to the Court and to present their own evidence. If Plaintiffs do not file a motion to extend court jurisdiction within the period noted above, or if the evidence presented fails to satisfy their burden of proof, this Agreement and the Court’s jurisdiction over this matter shall automatically terminate, and the case shall be dismissed. 42. Brief or isolated constitutional violations shall not constitute an ongoing, systemic policy and practice that violate the Constitution, and shall not constitute grounds for continuing this Agreement or the Court’s jurisdiction over this matter. 43. If the Court’s jurisdiction and this Agreement are extended by Plaintiffs’ motion, they shall both automatically terminate at the end of the extension period not to exceed 12 months and the case shall be dismissed unless Plaintiffs make the same showing described in Paragraph 41. Any successive extensions under this Paragraph shall not exceed twelve months in duration, and any extension shall automatically terminate if plaintiffs fail to make the requisite showing described in Paragraph 41. 44. To the extent that this Agreement and the Court’s jurisdiction over this matter are extended beyond the initial twenty four-month period, CDCR’s obligations and production of any agreed upon data and documentation to Plaintiffs’ counsel will be extended for the same period. The role and duties of Magistrate Judge Vadas, as described in Paragraphs 48-50 and 52-53, shall be coextensive with that of the Agreement, and in no event shall those roles and duties extend beyond the termination of the Court’s jurisdiction. 45. At any time after the initial twenty-four month period, Defendants and CDCR may seek termination of this case and the Court’s jurisdiction under the Prison Litigation Reform Act, 18 U.S.C. § 3626(b)(1)(A). 46. If there is a motion contesting Defendants’ compliance with the terms of this Agreement pending at the time the case is otherwise to be terminated, the Court will retain limited jurisdiction to resolve the motion. 47. It is the intention of the parties in signing this Agreement that upon completion of its terms it shall be effective as a full and final release from all claims for relief asserted in the Second Amended Complaint and the Supplemental Complaint. Nothing in this Agreement will affect the rights of Plaintiffs regarding legal claims that arise after the dismissal of this case. A. MAGISTRATE JUDGE NANDOR J.VADAS. 48. To assist the parties in ensuring compliance with this Agreement, the parties agree that Magistrate Judge Vadas will assume the role and duties as set forth in Paragraphs 48-50 and 52-53. These duties shall commence upon the Court’s preliminary approval of this Agreement and shall continue in accordance with Paragraph 43. 49. Following the Court’s preliminary approval of this Agreement, Plaintiffs’ counsel, CDCR officials, Defendants’ counsel, and Magistrate Judge Vadas shall meet on a monthly basis or at other mutually agreed-upon dates to discuss questions and concerns regarding CDCR’s compliance with the Agreement. The parties and Magistrate Judge Vadas may determine that such meetings can occur on a less frequent basis, but no less than every three months. No later than one week prior to the meetings contemplated by this Paragraph, Plaintiffs’ counsel shall circulate an agenda to Defendants and Magistrate Judge Vadas setting forth the items to be discussed. The meetings described in this Paragraph may be accomplished telephonically or by other means. Defendants shall meet with Plaintiffs’ counsel and the four inmate representatives semiannually to discuss progress with implementation of this Agreement. No later than one week prior to these meetings, Defendants shall submit to Magistrate Judge Vadas and Plaintiffs’ counsel a compliance report setting forth progress toward implementation. 50. Magistrate Judge Vadas may conduct institutional visits and meet with any inmate subject to or affected by the terms of this Agreement. Magistrate Judge Vadas may submit to the parties and the Court a written compliance and progress review assessing the matters under his purview according to this Agreement after 18 months, irrespective of any other motions or matters under Magistrate Judge Vadas’s review. Among the matters addressed shall be a review of the conditions and programming in the RCGP and whether they comport with the design and purpose of that unit as provided in this Agreement. 51. The parties shall agree on a mechanism by which CDCR shall promptly respond to concerns raised by Plaintiffs’ counsel regarding individual class members. 52. If Plaintiffs contend that current and ongoing violations of the Eighth Amendment or the Due Process Clause of the Fourteenth Amendment of the United States Constitution exist on a systemic basis as alleged in the Second Amended Complaint or Supplemental Complaint or as a result of CDCR’s reforms to its Step Down Program and SHU policies contemplated by this Agreement, Plaintiffs shall provide Defendants with a brief written description of the basis for that contention and may request that the parties meet and confer to resolve the issue. Defendants shall respond to Plaintiffs’ contentions no later than 30 days after receipt of Plaintiffs’ written description of the issue. If the parties are unable to resolve the issue informally, Plaintiffs may seek enforcement of the Agreement by seeking an order upon noticed motion before Magistrate Judge Vadas. Plaintiffs must demonstrate by a preponderance of the evidence that CDCR is in material breach of its obligations under this Agreement. Defendants shall have an opportunity to respond to any such evidence presented to Magistrate Judge Vadas and to present their own evidence in opposition to any enforcement motion. If Plaintiffs have demonstrated by a preponderance of the evidence a material noncompliance with these terms, then for the purposes of Plaintiffs’ enforcement motion only, the parties agree that Plaintiffs will have also demonstrated a violation of a federal right and that Magistrate Judge Vadas may order enforcement consistent with the requirements of 18 U.S.C. § 3626(a)(1)(A). An order issued by Magistrate Judge Vadas under this Paragraph is subject to review under 28 U.S.C. § 636 (b)(1)(B). 53. If Plaintiffs contend that CDCR has not substantially complied with any other terms of this Agreement that do not amount to current, ongoing, systemic violations as alleged in the Second Amended Complaint or Supplemental Complaint of the Eighth Amendment or the Due Process Clause of the Fourteenth Amendment of the United States Constitution, they may seek enforcement by order of this Court. Plaintiffs shall provide Defendants with a brief written description of the basis for that contention and may request that the parties meet and confer to resolve the issue. Defendants shall respond to Plaintiffs’ contentions no later than 30 days after they receive Plaintiffs’ written description of the issue. If the parties are unable to resolve the issue informally, Plaintiffs may seek enforcement of the Agreement by seeking an order upon noticed motion before Magistrate Judge Vadas. It shall be Plaintiffs’ burden in making such a motion to demonstrate by a preponderance of the evidence that Defendants have not substantially complied with the terms of the Agreement. Defendants shall have an opportunity to respond to any such evidence presented to the Court and to present their own evidence in opposition to Plaintiffs’ motion. If Plaintiffs satisfy their burden of proof by demonstrating substantial noncompliance with the Agreement’s terms by a preponderance of the evidence, then Magistrate Judge Vadas may issue an order to achieve substantial compliance with the Agreement’s terms. An order issued by Magistrate Judge Vadas under this Paragraph is subject to review under 28 U.S.C. § 636(b)(1)(B). 54. Defendants shall not retaliate against any class representative, class member, or other prisoner due to their participation in any aspect of this litigation or the Agreement. Allegations of retaliation may be made to Magistrate Judge Vadas in accordance with the procedures set forth in Paragraph 53. 55. Defendants agree to pay Plaintiffs’ counsel attorneys’ fees and costs for work reasonably performed on this case, including monitoring CDCR’s compliance with this Agreement and enforcing this Agreement, and for work to recover fees and costs, at the hourly rate set forth under the Prison Litigation Reform Act, 42 U.S.C. § 1997e(d). Plaintiffs preserve all arguments for attorneys’ fees and costs without limitation. The Prison Litigation Reform Act applies to all applications for attorneys’ fees in this case. Plaintiffs shall have sixty days from the entry of a final order approving this Agreement to file their motion for attorneys’ fees and costs for work reasonably performed before that date. Subject to the provisions under 42 U.S.C. §§ 1988 and 1997e, Plaintiffs’ motion may request an award that includes their expert fees. On a quarterly basis, Plaintiffs may file motions for reasonable attorneys’ fees accrued in monitoring and enforcing CDCR’s compliance with this Agreement. 56. The notice to the class members shall explain that Plaintiffs will file a motion for attorneys’ fees following entry of a final order approving the Agreement. 57. The parties will jointly request that the Court preliminarily approve this Agreement, conditionally certify a settlement class, require that notice of the proposed settlement be sent to the classes, provide for an objection period, and schedule a fairness hearing. Prior to or concurrent with the joint motion for preliminary approval, the parties will jointly request that the Court stay all other proceedings in this case pending resolution of the fairness hearing. Following the close of the objection period, the parties will jointly request that the Court enter a final order approving this Agreement, retaining jurisdiction to enforce it, and continuing the stay of the case pending the completion of the Agreement’s terms. 58. If this Agreement is not approved by the Court, the parties shall be restored to their respective positions in the action as of the date on which this Agreement was executed by the parties, the terms and provisions of this Agreement shall have no force and effect, and shall not be used in this action or in any proceeding for any purpose, and the litigation of this action would resume as if there had been no settlement. 59. This Agreement reflects the entire agreement of the parties and supersedes any prior written or oral agreements between them. Any modification to the terms of this Agreement must be in writing and signed by a CDCR representative and attorneys for Plaintiffs and Defendants to be effective or enforceable. 60. This Agreement shall be governed and construed according to California law. 61. The parties waive any common-law or statutory rule of construction that ambiguity should be construed against the drafter of this Agreement, and agree that the language in all parts of this Agreement shall in all cases be construed as a whole, according to its fair meaning. 62. This Agreement shall be valid and binding on, and faithfully kept, observed, performed, and be enforceable by and against the parties, their successors and assigns. 63. The obligations governed by this Agreement are severable. If for any reason a part of this Agreement is determined to be invalid or unenforceable, the presumption will be that such a determination shall not affect the remainder, subject to a party’s right to raise the severability issue in accordance with Paragraph 53. 64. The waiver by one party of any provision or breach of this Agreement shall not be deemed a waiver of any other provision or breach of this Agreement. o All inmates shall have access to GED, high school, and college level educational programs, with adequate academic support. receive special purchases, as provided in subsections 3190(j) and (k). o The local Inter–Disciplinary Treatment Team may further restrict or allow additional authorized personal property, in accordance with the institution’s Psychiatric Services Unit operation procedure, on a case by case basis above that allowed by the inmate’s assigned privilege group. o Yard -commensurate with Level 4 GP, but with a minimum of 10 hours per week. o Access to GED, high school, and college level educational programs, with adequate academic support. shall have the discretion to increase this schedule to 1 contact visit every 90 days, on a case by case basis. violation for which the loss of privileges imposed restricts visiting. Small Group programming available in Steps 3, 4, and in the RCGP may include: anger management, parenting skills, understanding criminal thinking, drug & alcohol abuse counseling. These programs shall be provided based on the needs of the inmate.